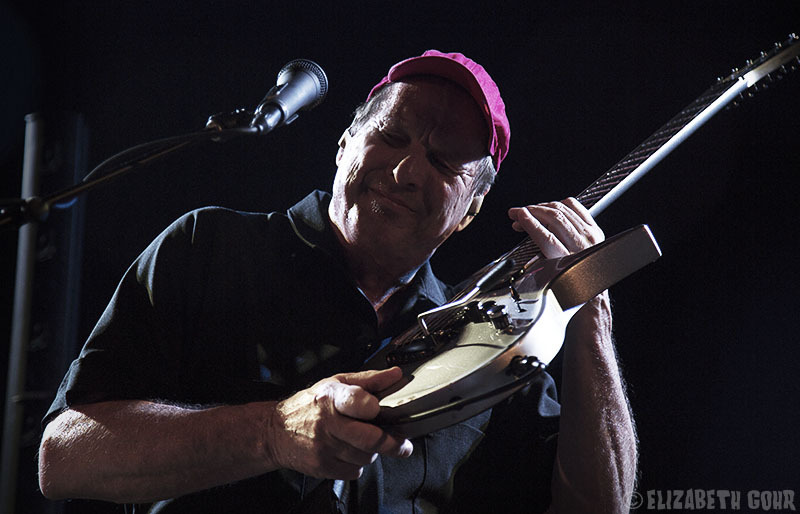 Idiosyncratic guitarist Adrian Belew, known both for his work as a solo artist and as a member of King Crimson, came to The Chapel on a Tuesday night to perform an eclectic set of songs spanning his entire musical career. What makes Belew’s sound so unique is his use of effects pedals, guitar synthesizers, and all types of feedback/noise that makes for an incredibly dense sound that is also unpredictable. In addition, his music is so eclectic in its composition that you’re always left guessing as to where it is going to go next. 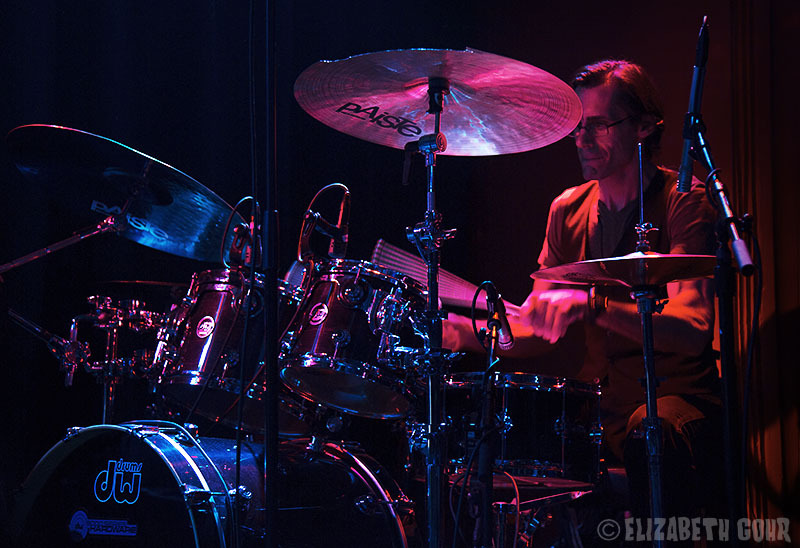 His incredible rhythm section of Julie Slick (bass) and Tobias Ralph (drums) had no trouble keeping up with Belew’s wacky playing style. 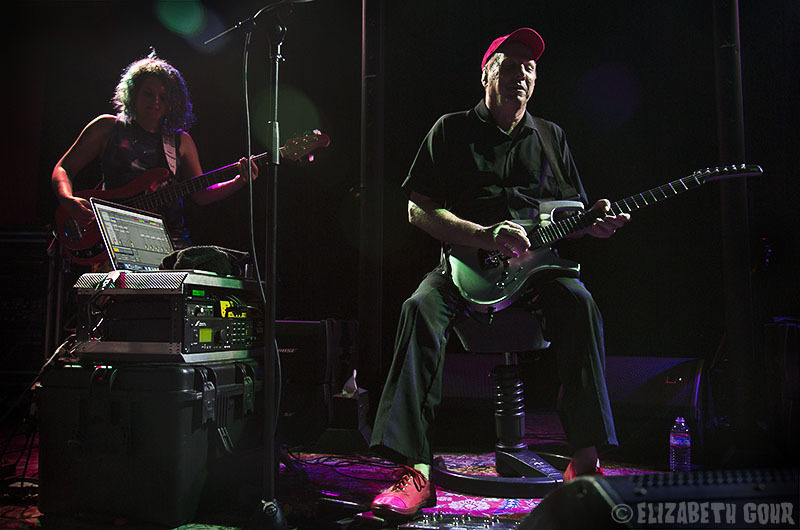 This became apparent during the first few songs of the set, culled from Belew’s solo work: with each song veering off into random directions all while retaining its musical core, such as the sprawling rocker “Big Electric Cat.” Following this was the odd-sounding prog-rock of “d2” off the 2009 release e. The song revolves around a series of driving guitar parts set to a pounding military march beat, with Belew making elaborate use of looper pedals to multi-track his guitar work. After this was the first King Crimson song of the night, the breezy and jazzy “One Time.” Featuring a laid back arrangement, the piece served as the perfect counterpoint for the remainder of the set, which would consist of even more wacked out music. Next up was the fantastic “Dinosaur” from the King Crimson album THRAK. The song is a straight forward rocker but it contains some of the most nonsensical lyrics Belew has ever crafted, taking the perspective of a long dead dinosaur whose bones are being dug up. A few songs later Belew rolled out another King Crimson stunner, this time from the critically acclaimed Discipline album: “Frame by Frame.” Driven by an angular guitar line and a booming bassline the song switches between laid back, tribal music (punctuated by a particularly snappy drum beat), and frenetic guitar. 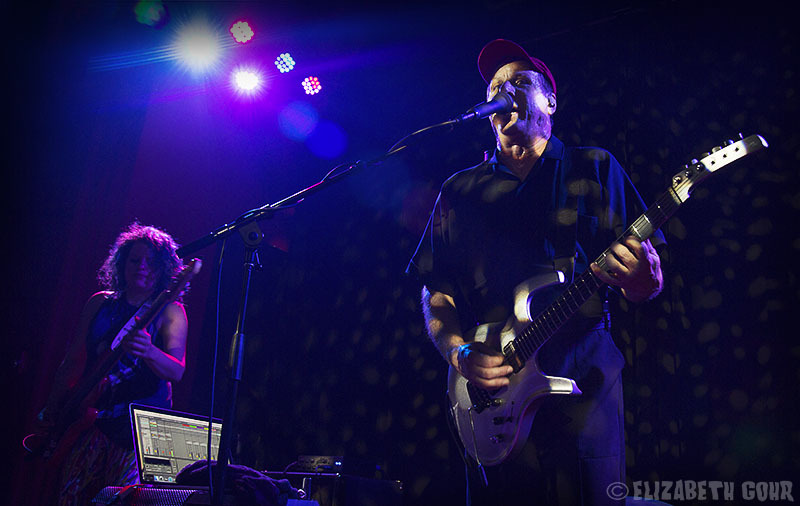 The band closed out the first portion of the set by performing “Beat Box Guitar,” which, as the name suggests, featured an array of complex rhythmic guitar sounds from Belew, who somehow managed to pull even more ridiculous sounds out of his instrument. Following a brief intermission, the band returned to the stage to play the sprawling “Three of a Perfect Pair.” Riding a propulsive guitar line and some of Belew’s strongest vocals of the night, the song is a perfect demonstration of how in sync the trio is with one another: perfectly complementing the song, and nailing the challenging time and feel changes present in the song. A few songs later the trio closed out the main portion of the set with another King Crimson classic the funky “Thela Hun Ginjeet.” Featuring another set of nonsensical, absurdist lyrics, the song rides a snappy bassline from Slick, who seemed to easily manage the task of keeping up with Belew’s guitar acrobatics, and a propulsive beat from Ralph. For an encore the band rolled out the dense “e” from the album of the same name. 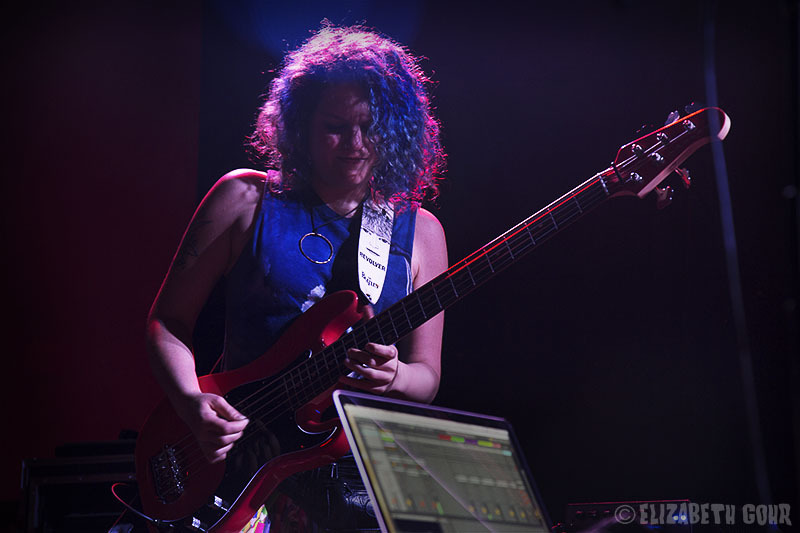 The instrumental track begins at a dizzying pace with a nimble guitar figure taking center stage over a pounding drum/bass groove before going totally off the rails, with both Belew and Slick matching each other in both note density and fretboard dexterity. You could see throughout the whole night just how much fun the three of them were having on stage. Many musical passages seemed to spontaneously come out of nowhere and descend into total improvisation, a mark of a truly tight and powerful band. While many fans would like to see Adrian Belew back in with the other members of King Crimson, the demonstration of power by his current trio is more than satisfying. 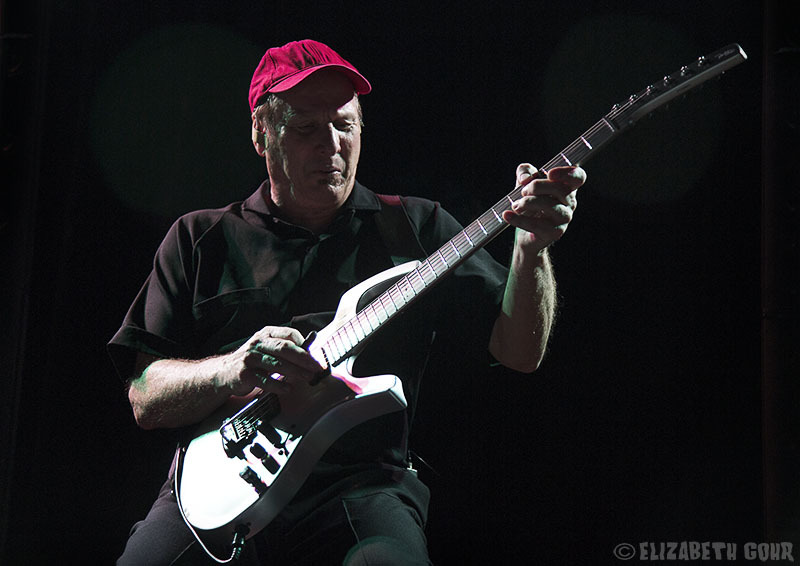 For more information about Adrian Belew, check out his website.